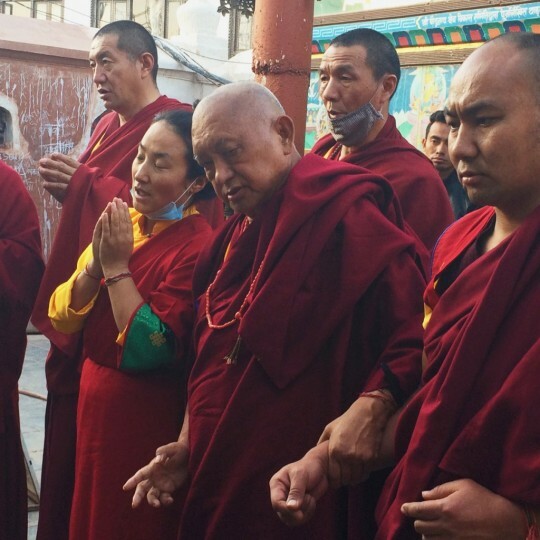 A student in prison wrote Lama Zopa Rinpoche to ask Rinpoche to be his guru. Thank you very much for your kind letter. I accept. I am not qualified, but I accept to do what I can. Please find enclosed the practice that is my advice to do every day. Also, I am sending you some past advice I have given to people in prison, maybe you have read this already. The way to think is that being in prison can be like being in retreat. People live outside of prison, with all the opportunities and having freedom, but they often don’t practice Dharma. You should think that even though you don’t have freedom, it can be like being in retreat. Being in prison gives you time to meditate on the path to enlightenment; to do purification practices, to purify past negative karma collected since beginningless time; to collect extensive merit; and to meditate on the lam-rim – the graduated path to enlightenment – such as renunciation, the sufferings of samsara, the six realm sufferings, bodhichitta, emptiness and so forth. It gives you time to understand that we have to free the numberless sentient beings from the oceans of samsaric sufferings and to do that we must purify our defilements, which are the causes of suffering, which have caused one to be in prison. Also, we need to collect extensive merit and actualize the path. To do that, we need to meditate on the lam-rim and to have experiences of the lam-rim, such as the six realm sufferings, especially the sufferings of the lower realms and so forth. The idea is to spend your time in prison practicing Dharma; then there will be great success as it becomes a place of retreat and gives you the opportunity to have mental freedom for yourself. In this way, there is not just the happiness of this life, but the happiness of future lives and liberation and enlightenment. The main thing is to have peace of mind wherever you practice Dharma and to achieve happiness now and in future lives for oneself and for the numberless sentient beings. This is not just temporary happiness, but ultimate happiness – liberation from the oceans of samsaric sufferings in the six realms, ultimate freedom. And not only that, but the peerless happiness, the total elimination of all the obscurations and completion of all the realizations. You will be able to free them from the oceans of samsaric sufferings and, not only that, bring them to full enlightenment, the peerless happiness. This is the purpose of being in prison, the ultimate purpose of one’s life in prison. You should know this. It gives yourself, by your mind, total freedom – freedom to achieve enlightenment. The main thing is for you to not see all this – not having freedom – as an obstacle. You should think that you have the best freedom to free yourself and all beings from samsara by practicing the path. This is the BEST OPPORTUNITY! Please try to think this way. Scribed by Ven. Holly Ansett, Kachoe Dechen Ling, California, United States, November 2015. Edited for inclusion on FPMT.org. Liberation Prison Project (LPP) is an FPMT international project dedicated to supporting students in prison who wish to study Dharma. Find more Mandala archive stories about LPP online.